The scratchings of graffiti seem trivial and puerile on the surface but their tactical operations, often taken spontaneously on the fly with whatever writing implement might be on hand, offer an easily accessible lesson in everyday resistance. While ducking into a coffee shop across the street from the Royal Ontario Museum I caught a glimpse of this. 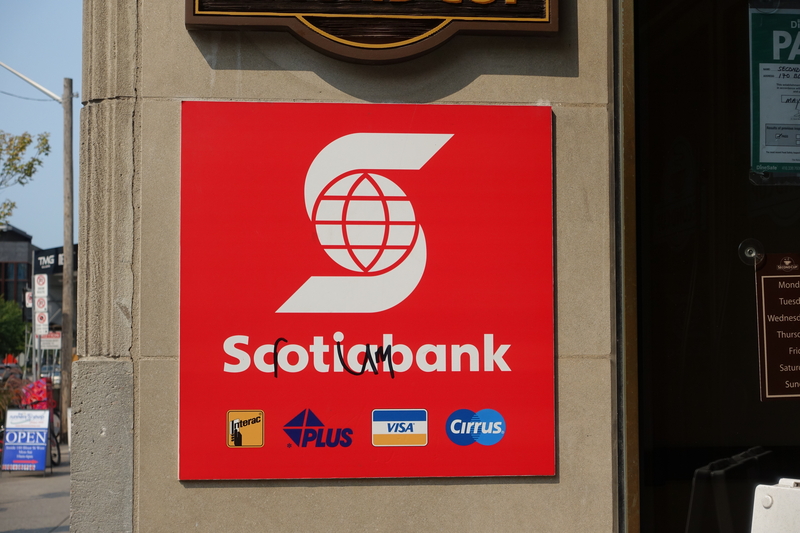 The mind of a passerby thought of a creative way to add three letters and replace one in the name of the Scotiabank, the third largest bank in Canada, to create an entirely different bank—Scrotumbank. In a single deft maneuver an advertisement for the anonymous power of the bank becomes humorously deflected. Owning a mortgage to Scrotumbank is an entirely different feeling altogether.